PICTURES TO COME! 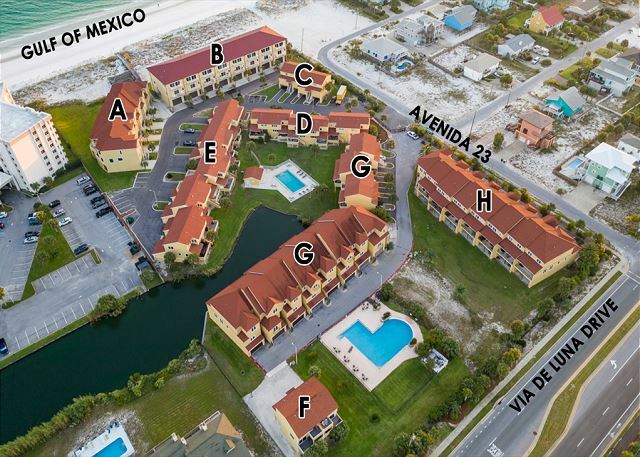 This 3 bedroom/2.5 bath pool view townhome is just steps from the Gulf, with easy access to the pristine white sands of Pensacola Beach via a dune walkover. King in master bedroom, queen in 2nd bedroom and full bed in 3rd bedroom to sleep 6. Slate and hardwood floors first living level, carpet in bedrooms. At the end of a sun-soaked day on the beach, enjoy flat screen TVs in both the living area and master bedroom, plus a DVD player. Or, spend a leisurely evening on your balcony grilling on the gas grill. Double garage on ground level with garage door living and dining area located on 2nd living level, bedrooms are on the top level. A gated community, Regency Cabanas offers two pools.